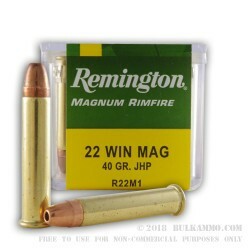 A classic hunting load for the .22 Winchester Magnum (.22 WMR) rimfire round. The 40 grain jacketed hollow point being copper plated and exhibiting quite a bit of performance from an old school rimfire load. A shooter can expect excellent performance from the cartridge for anything in the small and varmint class of game animals. The static ballistics on the round are exceptional: it achieves 1910 feet per second velocity out of the muzzle and offers 324 ft. lbs. of energy at the bore exit. This is more than enough to take out any reasonably sized small game animal at intermediate or even what could be considered longer ranges for the rimfire cartridges – say, out at 200 yards. Remington in the green and yellow packaging has been a mainstay throughout the shooting closets and gun safes of hunters for many decades. For some, there is no other choice. 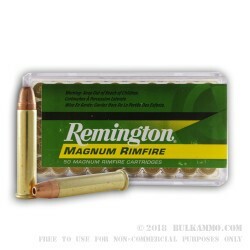 The reliability of Remington ammunition is hard to beat. The astute changes over the years to the ammunition lines by Remington has endeared users to the company and the build quality is top tier. This is a non-reloadable rimfire cartridge with a 40 grain projectile in the .22 WMR caliber.